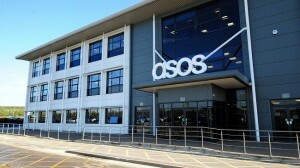 Online fashion retailer Asos is to further invest in its distribution centre in South Yorkshire after posting a 14% rise in half-year profits. Revenues at the company surged 37% to £911.5m in the six months to February 28th, while pre-tax profits went up to £27.3m. And helped by the post-Brexit collapse in the pound, international sales grew by 54% to £548.4m. It is now looking to invest in its huge facility in Barnsley, which already employs around 4,000 people. In its trading update, the company said: “During the first half of this year, a second despatch sorter was added in Barnsley, and assisted the operation in setting new despatch records during the ‘Black Friday’ promotional event. “Our investment at Barnsley continues, with a fifth packing module currently being installed, and due to be operational by the end of the financial year in readiness for the peak trading period. This will provide us with additional capacity to support future growth. Asos, which said it expected full-year retail sales to rise by between 30 and 35%, now has a total of 14.1 million active customers worldwide, up from 10.9 million in February last year. As well as the UK site, it also has local websites in the US, France, Germany, Spain, Italy, Australia and Russia.